Coconut oil is one of the healthiest ingredients on the planet, and it boosts overall health. It is extremely helpful for your skin, hair, nails, and due to this, it is often added to body creams, sunscreens and beauty products. Coconut oil and milk have been commonly used by women in India, Burma, Sri Lanka, Malaysia, Indonesia, Philippines and the Carribean, in order to keep their hair long, silky, and naturally colored. Coconut oil is even better than mineral oil and sunflower oil, in the prevention of hair damage. It is the only oil which reduces protein loss and boosts the shaft. Apply it on the hair ends to repair them. Yet, make sure you trim them off every 6 weeks. Hair loss might be a result of various inflammatory skin conditions, fungal infections, and nutritional deficiencies. On the other hand, coconut oil is rich in healthy fats which are beneficial for the scalp and shaft, soothe inflammation, and treat skin infections. Mix 2 tablespoons of sage oil and 3 tablespoons of coconut oil, and cook them over low heat to mix. Then, leave them to cool until warm and apply the mixture on the head at bedtime. Cover with a shower cap, and leave it thus until the next morning. Then, wash it off. Pigment cells are located at the base of the follicle of the hairs, and they give the hair color. Yet, they die over the time and become less efficient. 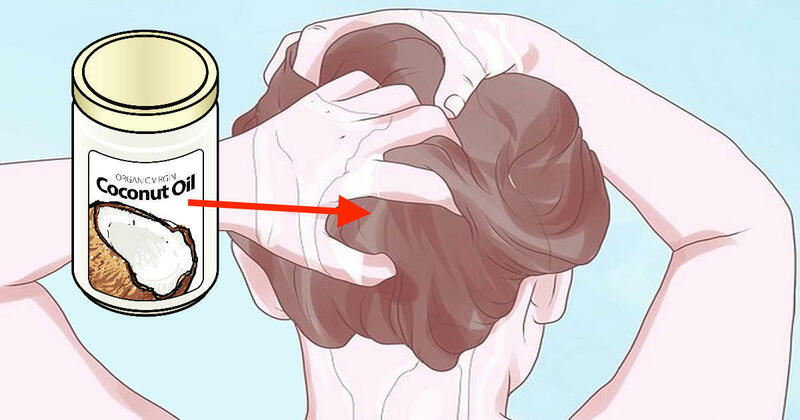 Massage the hair with lemon and coconut oil for 15 minutes every day to nourish the scalp and protect the base of the hair follicles, and thus prevent gray hair. Frizzy hair is usually a result of excessive dryness of the cuticles and hair shaft. Yet, this oil repels water as it is hydrophobic, but at the same time, it retains the moisture within the hair shaft. 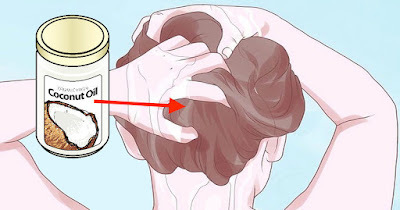 Apply coconut oil 10-15 minutes before washing the hair. This will make the hair smooth and silky. To brush through the hair easily, apply some coconut oil on the hair ends as well. Coconut oil can also be used for hair styling, as it tames flyaways and slicks down the hair. Dandruff is a common chronic scalp condition, caused by dry skin, fungus, or other factors, and its main symptom is flaking of the skin on the scalp. Coconut oil fights fungal infections and hydrates the skin, thus treating dandruff. Mix castor oil and coconut oil in equal amounts, and massage the scalp with the mixture. Leave it to act for half an hour, and then wash it out. Repeat this every time you wash the hair in the case of severe dandruff. Lice are most common in young children, and products for their elimination are always rich in toxins and chemicals which burn the scalp and damage the hair. This oil can be of great help as it hydrates the skin instead of irritating it and kills even the pesticide-resistant lice. It coats lice and gradually suffocates them. Moreover, it does not allow lice or their eggs to hang onto the hair shafts. You should apply it evenly to the hair, leave it to act for several days, and continue applying it as it gets absorbed. For even better effects, mix the coconut oil with a few drops of tea tree oil. Therefore, we strongly suggest using this remarkable oil for your hair. Also, note that you should always use organic coconut oil. Many organic or herbal shampoos contain coconut oil, but make sure you add it if they lack it to enjoy its potent properties.